The NorCal STEM Education Foundation invites local and regional partners to attend and exhibit at the College & Career Expo in tandem with the Sacramento Regional STEM Fair! All exhibitors are welcome - STEM exhibits and showcases are encouraged. Exhibits are always open to the public and be visited by the region's students, parents, teachers and more! Join us for the event - a great way to reach out and market! Expected Attendees: Area parents, students, teachers and more! Please send a representative to the Exhibitor Check-in table prior to set up. 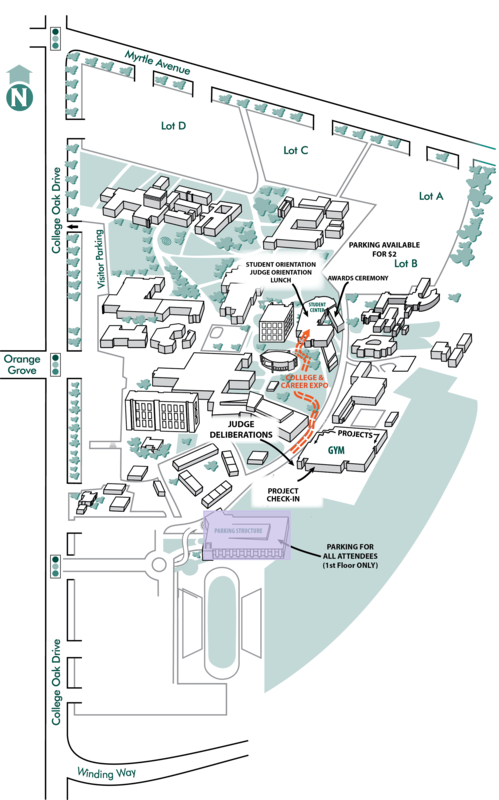 The Exhibitor Check-in table will be hosted as you enter the Student Center from Parking Lot B. Click here to view the map. The College & Career Expo is expected to have over 1,000 attendees from the Northern California region. The Expo takes place in tandem with the Sacramento Regional STEM Fair, thus all student participants, their families, and teachers will be able to walk the grounds. Also, the Expo is marketed throughout community and partner events throughout the year. All exhibitors will need to await 4:30PM to begin tear down, unless otherwise arranged with Staff. To protect our exhibitors, students and volunteers, please report any violations or suspicious activity you may observe at the Event to a participant in the official Fair shirt, a blue polo with the green logo on the chest, immediately. Lunch will be available for exhibitors on site. The College & Career Expo will be outside, weather permitting. If the weather is unfavorable, the Expo will take place in and around available buildings. Below is a rough map of American River College. A detailed map is to follow. Please notify staff if you would like a table cloth. Listing in the program, feature in our newsletter, The BEAKER, and recognition on our website. Volunteers to assist exhibitors will be available. During the Event, volunteers will be readily available. Please have a member of your team check-in as soon as you arrive at the Exhibitor Check-in table to be hosted in front of the Student Center entrance as you come in from Parking Lot B. Check- in will be open from 11:00AM to 12:00PM. Exhibitors who need more time for set up should arrive as early as possible, whereas exhibitors who have less set up can arrive closer to opening. We will be opening the Expo promptly at 1:00PM with a broadcast announcement throughout the entire event. If you are planning to bring a truck or other vehicle to help you unload or as part of your exhibit, please contact Nadia Compton, at ncompton@sacSTEMfair.org or at 916.441.3150 to arrange accommodations. All exhibitors should enter the grounds via the Myrtle Avenue into Parking Lots A and B (see Directions and Parking). Look for directional signage to lead you to exhibitor parking, and check-in. If you need help bringing in your materials, please let check-in know. A limited number of exhibitors may be required to move in during certain hours. Those companies involved will be notified in advance to make arrangements. If you have specific needs due to the size or structure of your exhibit, you must contact us to make arrangements for your move-in. If you have not made arrangements, you may not be able to install part or all of your displays until after other exhibitors have moved in. Exhibits must be removed from the grounds by 6:00 PM, Saturday, March 25. Items remaining in place on the grounds after this time will be removed by the volunteers and may be disposed of. Official release time is 5:00PM. Staff will direct the official close time based on conditions to ensure the safety of attendees and exhibit workers. Please do not begin to dismantle your booth until the official announcement is made. Exhibitor vehicles are not allowed to approach the building prior to 6:00 PM (unless previously arranged) so that attendees can leave without being impeded by vehicular traffic. Exhibitors are welcome to carry out any items through the regular entrances after they have been released. Staffing your exhibit is an important element of booth planning. Fortunately, getting your staff registered and securing your registration won't be as complicated as deciding who is on the exhibiting team! Register to be an Exhibitor Here! We're committed to helping you make your College & Career Expo experience as profitable and productive to your business as possible - that's why we've created this Marketing Tool Kit designed to help you promote your participation, build brand awareness and drive increased traffic to your exhibit. The Kit is loaded with everything you need to promote both our event and your presence at the show. Take advantage of the marketing items below and maximize your time at the 2019 College & Career Expo! Are you on Twitter? Follow @sacstemfair and tweet about your presence at the 2019 event. Be sure to use #sacSTEMfair in your promotions! Use logos or banner ads on your website, in email communications, or in printed materials to promote your presence at the 2019 NorCal STEM Education Foundation College & Career Expo. Please link all logos to www.sacSTEMfair.org. If you require a different format or size, please contact staff. We always welcome the opportunity to highlight speakers and exhibitors who are participating at the CCE. Please contact Nadia Compton if you are interested in sending in a video. This is a great and engaging way to promote before and after the event! Download print & media templates to advertise your attendance at the Expo! College & Career Presenting Sponsorship: The Expo will be listed as "presented by" your organization. Your organization or company will be provided 5 event spaces for no registration fee, your organization's name & logo associated with the Expo event in all promotional and event materials and on the website, and a 1/2 page ad in the program or marketing equivalent. For more sponsorship information, visit our Sponsorship page.